Soft pillow, sleeping bag and liner and a hot water bottle on nights in local tea houses. 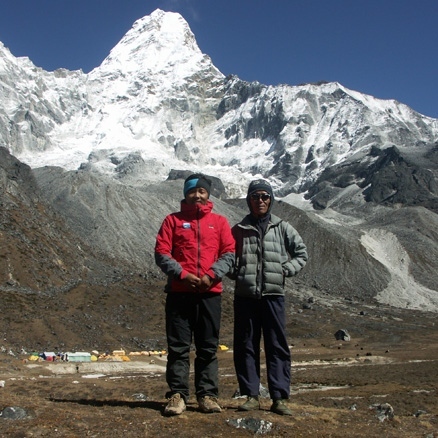 Trek to Annapurna Base Camp in the spectacular Annapurna Sanctuary with the best lodges and service along the way. Having travelled with Mountain Kingdoms several times previously, we felt confident that we would be well looked after. The trek crew were very supportive and great fun to be with. We had a tremendously enjoyable holiday and your hard work on the pre-trip extension paid off very well indeed. The trekking was great. The group gelled really well and the local sirdar and his team were brilliant. Dwarika’s Hotel was superb, and wonderful mountain scenery. This special trek combines luxury lodges where available with the best available tea houses and many extras included which will enable you to trek in the shadow of Annapurna in the most comfortable possible way. This magnificent trek is one of the most spectacular in Nepal and takes you up into the Annapurna Sanctuary, a high glacial basin lying north of Pokhara and known as a ‘Sanctuary’ because of its natural serenity and beauty and its religious significance to local people. The focus of your trek is Annapurna Base Camp, a magnificent spot located at 4,130m/13,550 and set below a ring of eleven of Nepal’s major peaks. Sunrise from the moraine above base camp is an unforgettable experience and you will have spectacular views of these giants, including the immensely impressive south face of Annapurna I. This isolated cirque of peaks can only be approached by one route, the scenic gorge of the Modi Khola River which carves its way between the Machhapuchare and Hiunchuli and into this hidden fortress of mountains. The luxury Lodges, where you will stay for four nights of your trek, provide an extremely high standard of accommodation with comfortable bedrooms with attached bathrooms, a high standard of service and excellent food. On the nights when you stay in tea houses we will ensure that these are the best possible available and extras will be provided to ensure you have a comfortable stay such as a nightly happy hour with snacks while in your rooms you will be provided with soft pillows, a good quality sleeping bag and liner along with a hot water bottle for the more chilly nights. And, for an extra touch of style, you will stay at Dwarika’s indulgent heritage hotel in Kathmandu giving you the best possible start and end to your holiday. Meal arrangements: All meals on trek are included. Bed & Breakfast in Kathmandu and Pokhara. Fly to Pokhara. Begin trek. Trek to Deurali via Ghandruk, Chomrong and Dovan. Trek to Machhapuchare Base Camp, 3,658m/12,000ft. Trek to Annapurna Base Camp, 4,130m/13,550ft. Enjoy views then descend to Himalaya. Trek to Chomrong and on to Landruk. Stop at hot springs en route. Trek the Nature Trail to Majgaun and continue to Damphus. End trek at Phedi and transfer to Pokhara. Fly to Kathmandu. Sightseeing tour. Fly to London. You will be met at the airport and transferred to Dwarika's Hotel, a luxurious and stylish hotel built in local palace style and furnished with Nepalese furniture, carvings and statues and offering with an elegant courtyard with a swimming pool. The hotel has several excellent restaurants. Dwarika's is a peaceful haven and an excellent place to unwind after the long flight from London. Day 3 - Fly to Pokhara. Trek to Sanctuary Lodge, 940m/3,080ft - 3 hours. You will be transferred to the airport for the short flight to Pokhara, the starting point for treks to the Annapurna region. After visiting the Ker and Downey office for a short briefing you will transfer to the village of Lumle, about a one hour drive. You meet your trek team and set off walking up a paved trail to the top of the ridge, giving you good views of the Pokhara valley below. You then cross the ridge over into the valley of the Modi Khola River which leads up to the high peaks. You should then have your first views of the mountains, including Machhapuchare, the so called Fishtail Peak. You then descend into this beautiful valley to your lodge for the night. The Sanctuary Lodge is set in a lovely location on a spur overlooking the River Modi, about twenty minutes from the village of Birethanti. If you have time on arrival you might like to make the short walk to Birethanti, an attractive Newari village with substantial houses and paved streets. Day 4 - Trek to Ghandruk, 2,012m/6,600ft – 5-6 hours. Today is quite a short day's walk but is mostly uphill. You will probably have a late lunch on arrival at your lodge. The long climb up to Ghandruk (also known as Ghandrung) takes you on steps up through lovely countryside of fertile cultivated terraces, small settlements and attractive farmhouses. You will share the path with local people and school children while all around you see the farmers working in the fields with buffalo drawn ploughs and traditional tools or pounding corn and weaving cloth out on the paved terraces of their well-built houses. As you climb you will have lovely views of the valley with the mountain up ahead and the river down below. You pass through the pretty village of Kimche, 1,554m/5,100ft, after about 3 hours and then continue up through rhododendron and oak forest and after another 2 hours you reach the Ghandruk's welcoming entrance arch. You then have a final climb, up through village streets, to the Himalaya Lodge where you will stay for the night. Ghandruk is a busy, prosperous village, well known for the many people from here who have served as soldiers with the Gurkhas. In the afternoon you may explore the village and see some of the local carpet weavers. From the terrace of your lodge there are fantastic close up views of the mountains and your route ahead! Day 5 - Trek to Chomrong, 2,170m/7,120ft - 5 hours. From Ghandruk village you contour round to a small pass on a ridge with a couple of tea houses and then you descend through forest to Khymnu (also known as Kimrong) an attractive small village on the banks of the Khymnu Khola, a tributary of the Modi Khola. From Khymnu you climb through farmland and forest to reach a high trail which takes you round to a corner of the trail above the Modi Khola. You then climb a little further before descending on wide steps into the village of Chomrong. Chomrong is the last true village on the way to the Sanctuary - further on there are just small settlements built to provide accommodation for trekkers going up into the Annapurna Sanctuary. From Chomrong you have great mountain views which include Annapurna South, 23,687ft/7,220m, Hiunchuli, 21,132ft/6,441m, Annapurna III, 24,786ft/7,555m, Machhapuchare, 22,943ft/6,993m, and Gandharba Chuli, 20,498ft/6,248m. Day 6 - Trek to Dovan, 2,600m/8,580ft - 5 hours. From Chomrong you descend on steps through terraced fields to cross the river on a long suspension bridge. From the bridge you ascend steeply through farmland and forest for about an hour and a half to Sinuwa Danda, a small settlement in the forest, built at a corner of the trail with views up the valley of your route ahead. From Sinuwa you continue through forest festooned with ferns and orchids for a further hour to the small settlement of Khuldi-ghar perched steeply on the valley side. Here your trekking permit and conservation ticket is checked and registered. You then descend across rock slabs into a dense bamboo forest. The trail climbs through this forest, often over a tangle of roots and fallen bamboo that can be slippery when wet, to reach the place known as Bamboo. You then continue up for another hour or so to reach the tea houses at Dovan. Day 7 - Trek to Deurali, 3,200m/10,499ft - 5-6 hours. Today you continue the ascent, trekking up and down through bamboo forest, high above the river, making height steadily until you reach the houses at Himalaya at 2,870m/9,416ft. From Himalaya you climb, in places very steeply now, to finally emerge into a more open alpine landscape with fewer trees and continue climbing to arrive at the welcome tea houses at Deurali. Day 8 - Trek to Machhapuchare Base Camp, 3,658m/12,000ft - 3-4 hours. You will now be feeling the altitude, as you get closer to the snowy peaks and the vegetation changes from forest to shrubs. From Deurali the trail narrows as you pass through the so called 'gates' of the Sanctuary, and then there are several steep climbs to reach the Machhapuchare Base Camp area at 3,658m/12,000ft. Because the peak of Machhapuchare is sacred to the Gurung people and considered the home of a Gurung goddess the peak has now been declared off limits to climbers and it has remained unclimbed, although a British expedition did climb to within 200m of the summit in 1957. To aid acclimatisation you will spend the night here rather than continuing directly to Annapurna Base Camp. It is worth climbing the moraine behind the tea houses to look out over the glacier and for the views back down to the Sanctuary Gates and up to the summit of Machhapuchare. Look out for blue sheep which are occasionally seen here. Day 9 - Trek to Annapurna Base Camp, 4,130m/13,550ft - 3-4 hours. From Machhapuchare Base Camp you take a trail winding up steeply for 1 hour. As you reach the upper ridge in the open, wide valley you enter a hidden amphitheatre with a complete view of an array of snowy peaks spread out around you. Another 1-2 hours of slow and steady walking will bring you to Annapurna Base Camp in the heart of the Annapurnas. Beyond the tea houses you may walk just a few minutes further to climb to the top of the moraine for the best possible views. Day 10 - Enjoy dawn views at base camp. Start descent. Today you will rise early to be rewarded with the spectacular sight of sunrise over Annapurna South and her awe-inspiring neighbours with a magical moment as the flush of pink first hits the peaks. Up here you are completely surrounded by soaring, snow-capped giants, including Annapurna 1, Tent Peak, Annapurna South, Hiunchuli, Gandharba Chuli, and Machhapuchare. You can look straight across the glacier at the towering south face of Annapurna 1 right in front of you and seemingly almost close enough to reach out and touch. It is all quite magnificent and unforgettable. After this feast of glorious mountain scenery, you will regretfully start your descent and retrace your steps back down past Machhapuchare Base Camp and on down through the gates of the Sanctuary. After so many days of ascent it is a real treat to be descending and your lungs will respond well to the lower altitude! You descend as far as Himalaya where you will stay overnight. Day 11 - Continue descent and trek to Chomrong. Today you trek back down through the dense forest of oak, rhododendron, pine and bamboo, all the way to Bamboo, a small settlement built to cater to the needs of the trekkers. From Bamboo, a 45-minute steep climb brings you back to Khuldi Ghar where you have to sign out before you leave. You walk through forest back to Sinuwa and then descend steeply to the river. After crossing the bridge, a final hour steeply uphill on steps brings you back to Chomrong village for your overnight stay. Day 12 - Trek to Jhin Danda and visit hot springs. Continue trek to Landrung. From Chomrong you climb the stone steps up and out of the village and back to the corner where there is a major fork in the trail. One way leads down steeply to your left while the other continues on round into the valley of the Khymnu Khola. You take the steep trail down and arrive at the houses of Jhin Danda where you will have lunch. While this is being prepared you may take a side trip down to visit some hot springs - it's about 20 minutes down through the forest to reach the springs and a little longer to climb back. Take a swim suit if you would like to bathe, a real treat after so many days trekking. After lunch you descend to cross the Kymnu Khola and then descend further to cross the Modi Khola at New Bridge (Nyaphul). From here you continue alongside the river for a while and then climb to the village of Landrung where you are back to the pleasures of a Ker and Downey Lodge, the Bee Lodge. Day 13 - Trek to Majgaun, 1,400m/4,620ft, along the ‘Nature Trail’ – 4 hours. Now you are back in the verdant land of the lower Modi Khola valley with its terraced fields and small, pretty villages. The trail contours along the side of the valley with some ups and downs as you trek downstream through rice fields and villages. You'll reach the Gurung Lodge in time for a late lunch. If you prefer a slightly easier day it is possible to walk down the jeep track to Majgaun. Day 14 - Trek to Damphus for lunch. Descend to Phedi and drive to Pokhara. Leaving the comforts of your lodge in Majgaun, this morning you have a lovely walk up through beautiful forest alive with birds to reach the top of a ridge. From here you descend to the small settlement of Pothana with its Tibetan souvenir sellers and continue downhill to the large village of Damphus where you will have lunch at the Basanta Lodge, 3-3½ hours trekking. After lunch you make a final steep descent to Phedi in about one hour where your transport will be waiting to take you back to Pokhara and on to your hotel. The afternoon will be free for you to relax in Pokhara, either at the hotel or you may venture out into town where, along the lakeside, you can find numerous bars and restaurants, internet cafes and places to shop for souvenirs. Day 15 - Morning flight to Kathmandu. Afternoon sightseeing tour. You will be transferred to Pokhara airport for the morning flight to Kathmandu and will be taken back to Dwarika's Hotel. In the afternoon you will have a sightseeing tour to Boudhanath Stupa, a Buddhist monument much frequented by Tibetan and other Buddhist pilgrims. You will then travel on to Pashupatinath, an important religious site for Hindus with its temple to the god Shiva and the ancient cremation ghats on the banks of the sacred Bagmati River. Day 16 - Depart Kathmandu and fly to London. Our holiday was one of those experiences that we will not forget and we made friends that we have have stayed in touch with after our return. We had unseasonal snow that made the trek more challenging and added an element of risk. The guides and porters were superb and nothing was too much trouble. The tea houses were more basic than we expected and the food was OK. It was great coming back to Dwarika's at the end for a touch of luxury. We added the Bhutan extension which was absolutely superb. The scenery and monuments were superb and we had a great guide. A very good addition to the ABC in style. We opted for a mid December start for our private trek to Annapurna Base Camp, so well beyond the peak trekking season. What a good choice this turned out to be! We understand that the paths, though certainly not deserted, were much quieter than in peak season. The tea houses and lodges were also quiet, enabling us to soak up the atmosphere and environment in relative peace and quiet. Our initial concerns about the cold did not materialise, partly because it was sunny virtually every day and also because the equipment provided by Mountain Kingdoms (sleeping bag and inner, down jacket, soft pillows and hot water bottle) were all good quality and warming. With the thick blankets provided at each location and wearing our thermal underwear/thick socks at night at higher altitudes, the danger was being too hot at night rather than too cold. The itinerary is excellent and enables plenty of time to be spent at the lodges and tea houses on arrival, soaking up the atmosphere and views. This was aided by it being a private journey as we could go at our own pace each day. This is not a difficult trek because the paths are extremely well maintained with much of the route being on slate/smooth rock. Accommodations were good, including the tea houses and the food was plentiful to keep us trekking. This was my second Mountain Kingdoms travel. It met my expectations again. I could only recommend it.